About 18 months ago, I interviewed actress Claudia Black for a story on voice actors. (You can read that one here). It was a great interview, we chatted for about an hour on various topics to do with voice acting, and our thoughts on where we thought the industry was going. One of her comments stuck with me. She mentioned she was working with Gore Verbinski, the director of Pirates of the Caribbean, for an animated movie called Rango. She said she had been at his company’s production offices for some sort of meeting, when she noticed a copy of Uncharted 2 sitting around. That sparked a conversation with the owner of the game, and in turn, Verbinski got involved. He talked about how much he loved games, and the huge potential for games to show the rest of the entertainment industry how to improve story-telling. Now, none of this is any big surprise. Anyone interested in the BioShock movie project would know Verbinski was attached to the movie for a long time, and ultimately abandoned it because it was simply too expensive and would require an R rating. But the conversation represents part of a key trend I feel is going to change the games industry within the next five to 10 years. Now, I’m not a futurist. I have no experience in either making films, or games. I’m just calling out the trend as I see it. Because it is a big trend, and one that has the potential to influence both the interactive and passive entertainment industries. One of the biggest trends in gaming hasn’t been motion-controlled games, or even the shift towards ultra-violence, although both of those things are real and worth discussing. Instead, I think motion-capture will be the shift that ultimately steers gaming towards becoming a medium that other entertainment creators, specifically in the film and television industries, will respect and actually want to be a part of. The casting of Ellen Page in the upcoming Beyond: Two Souls is simply a stepping stone in that process, and evidence that it is occurring. 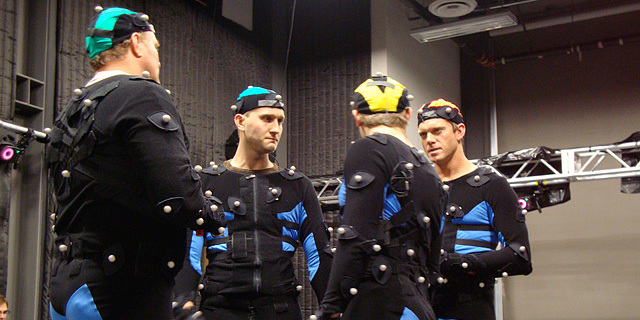 Motion-capture is something that has been around for years. It’s not new by any stretch of the imagination, and developers have been using it for a long time as a staple for complicated movement designs. But the past few years has seen a shift in the way we use motion-capture technology to the point where actual casting decisions are being made because of it. Developers are now using motion capture to control more realistic facial expressions, and in turn, portray more complex and nuanced emotion. This is the essence of David Cage’s comments this week when he said the PS4 would enable games to capture the human facial expression much clearer than ever before. If you take note of the major games released in the past six months, and in the coming release window, motion-capture is a staple. Ubisoft made a key point of the fact the characters in Assassin’s Creed III were filmed with motion capture, and made several mentions it worked with actor Michael Mando to portray the psychotic nature of Far Cry 3’s villain, Vaas. Square Enix made a big song and dance over the fact Tomb Raider will have a character completely tracked by motion-capture, and last year at E3, David Cage announced Beyond: Two Souls would once again be using motion-capture as the basis for its acting. Many of the games announced at E3 used some type of motion-capture, including those presumably set to appear on next-gen systems. The main argument used to warn against this type of shift is that mere technology isn't a conduit for better stories. The fact you can capture someone’s facial expressions better doesn't change anything about the way a story is written, or told. After all, a game with motion-capture is still going to have the same writers and directors. A bad game is a bad game whether or not a Hollywood actor takes part in it or not. But what I feel this argument fails to understand is that motion-capture isn't a goal unto itself, but rather a stepping stone in merging the relationship between games, and other industries which have talents in story-telling we can adopt. That is to say, Hollywood. Of course, games can learn from all sorts of industries. But I’m strictly talking about narrative-based storytelling, which makes up a large part of the mainstream gaming market. This part of my argument isn’t speculation, it’s actually happening. The games industry has moved away from just casting no-name voice actors to actually identifying the people who take part in the casting. Square Enix made a huge announcement about the fact Camilla Luddington would play Lara Croft in the reboot of Tomb Raider, and the fact Sony made the Ellen Page announcement at its E3 conference is a testament to how seriously it takes prestige casting, and will do in the future. Other games use AAA actors for voicing characters. So why did Sony make the announcement in such a grand fashion? This is to say nothing of the Uncharted series, or the way Naughty Dog has been emphasising the actors who will play the main characters in its upcoming game, The Last of Us. It even brought them in for a signing at E3. The shift is clear. Games developers are not only hiring more experienced actors to portray their characters, but they are putting more attention on those actors as the talent behind the game, just as a film production crew would for a movie press tour. This is in direct contrast to those arguments which state motion-capture doesn’t enhance the story-telling experience. That’s absolutely true, it does not. But it does allow actors to move above sub-par material by creating an emotional connection between them. Acting is reacting, and if actors are able to bounce facial expressions off each other the resulting experience will become more natural, more nuanced, and simply more enjoyable to experience. The shift towards motion-capture and hiring more experienced and well-known actors is simply a stepping stone towards an industry that embraces more modes of story-telling. The end result is not motion-capture in and of itself, but a marriage of industries, where talented screenwriters, directors, producers and developers work together not to create games that are like movies, or movies that are like games, but something different altogether. This is already happening. This month’s announcement JJ Abrams and Valve would work together on some projects encapsulates this perfectly, and they both said as much. Both of them criticised each other’s’ industry, and then suggested ways they could work together to fix it. Motion-capture goes a long way to fixing this. As more actors start watching talent such as JJ Abrams work with games developers, they will be exposed to new and exciting projects they can work on. Soon, directors will convince them working in a game isn’t a side-project you take for money, but roles that will be coveted by some of the best actors in the industry. (As a side note, I expect whatever project JJ Abrams and Valve work on together will include actors well known to Abrams' fans, but that's pure speculation on my part). And they’ll want to do so because of motion-capture. This is a marriage of theatre and gaming, a place where actors can actually go into a room, read a script written by people who understand the medium of gaming, and then look another actor in the eye. They can create real, tangible emotional experiences directed by people who know the interactive entertainment industry back to front. Again, this is not about making games more like movies, or simply making better cutscenes. It is a total re-imagining of the way we make these types of games, and how we get more people involved. JJ Abrams clearly understands this, wanting to get involved with games without making them like a film. They are clearly two separate mediums, and he understands this. But by working together, the two industries can create something even more interesting. There is much Hollywood screenwriters can teach games writers, and vice versa. It’s obviously not as simple as that, but these early signs are encouraging. The fact a massive talent like Abrams can be convinced games are a medium where he should be working is encouraging, not only to the games industry but to younger actors. Imagine Valve working with Bad Robot to cast its next game, looking at some of the brightest talent attracted by a script that is the hottest property of both Hollywood and the games industry. Besides, it’s already happening. The voice of Sam Fisher, Michael Ironside, wasn’t able to perform the role again because of his inability to perform the motion-capture requirements. Actual casting decisions are now being made on the basis of whether an actor can perform mo-cap. There are plenty of problems with all of this. This all depends on getting people who are actually talented into the games industry. And neither are especially good at highlighting women or minorities. But if motion-capture can bring two industries together to help them both achieve new types of story-telling, it’s at least a good start. As such, I expect in the next five to 10 years we'll start seeing actors in the upper echelons of film and television start pursuing games jobs because of the talent involved, not because of the money. So many actors want to work together and haven't had the chance - gaming can open up massive opportunities for them. I'm not saying it'll all be good, there'll be plenty of crap. But the fact a company like Valve can spot the opportunity in something like this suggests to me this is where the industry is heading. Best get used to it.